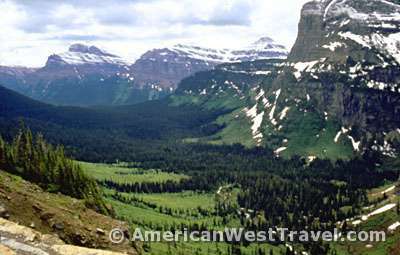 The highlight of Glacier National Park, the Going-to-the-Sun Road is one of the world’s finest scenic drives. But its name is not always fitting. 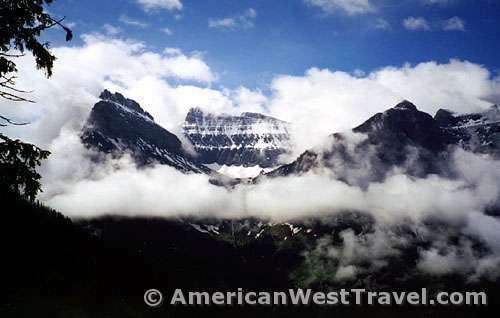 The fifty mile road connects the east and west sides of Glacier National Park, climbing spectacularly over the Continental Divide at Logan Pass, elevation 6,680 feet. However, as our photos attest, you don’t always “reach the sun”. 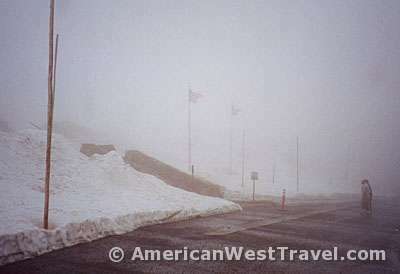 Our late June visit featured heavy fog and deep snow the day after a late spring storm. At right, a view to the valley floor from the Garden Wall area. The scenic pullouts in this section are very small and often full. The drive over the pass is much less hectic if you do it early in the day. However there is a good chance you will encounter fog and clouds near the top. The Garden Wall section also features an amazing number of waterfalls, especially in the late spring when the snow is melting. 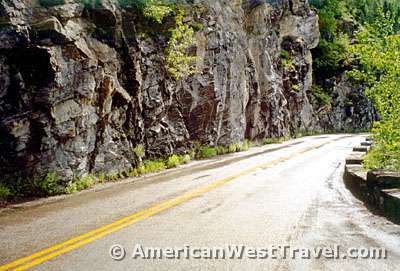 One of the most unusual falls is known as the Weeping Wall, a long section of rock wall adjacent to the road covered by running water. Unfortunately, this area was covered by a solid bank of fog during our visit so we couldn’t get the photo. The short stretch of dense fog with visibility of only a few feet made for pretty scary driving on the narrow, winding road. However we did photograph plenty of other falls. 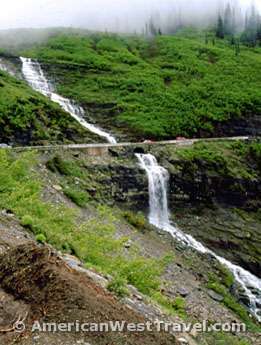 The falls, left, is actually a roaring creek which flows under the road and then thousands of feet down into the valley below. 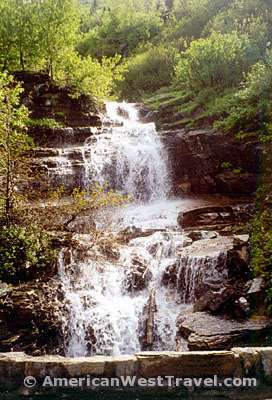 At left, a typical waterfall in the Garden Wall area. 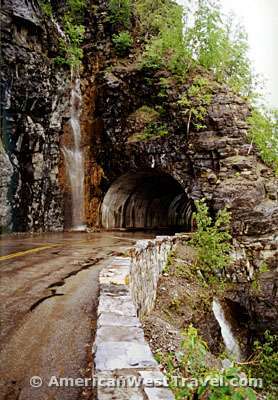 At right, a small waterfall and tunnel make an interesting combination. Note how the waterfall is drained under the road and then continues down the cliff. 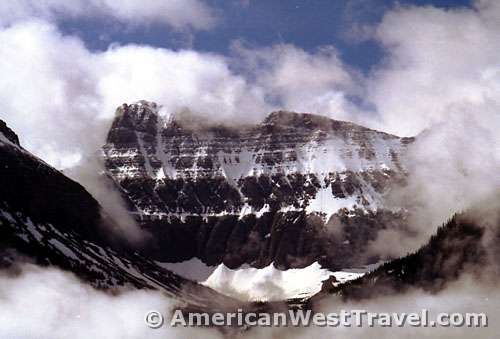 Views of the spectacular Continental Divide are also plentiful. The tallest peaks are about 10,000 feet in this area. 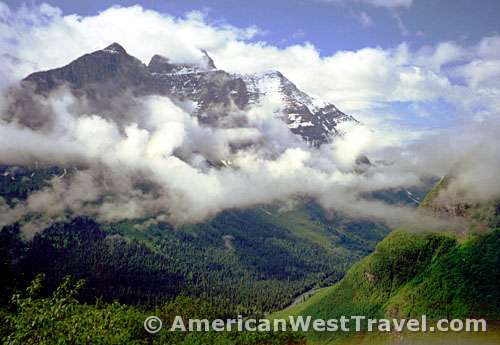 However the northern climate provides plenty of snow cover and numerous small glaciers. The peaks also tend to be steep and jagged which adds to the beauty. The breaking cloud cover also added to the scenery (where the fog had lifted). 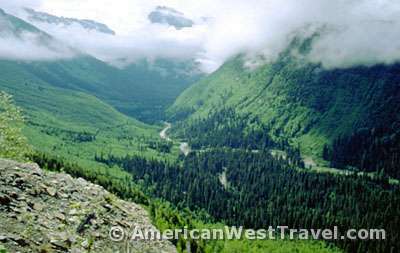 In the photos below, note the small glacier in the u-shaped valley. 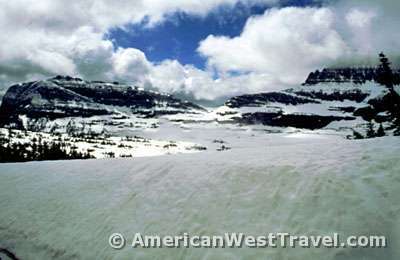 Logan Pass is the highest elevation on the drive and offers a harsh alpine climate with stark scenery. This visit offered dense fog, a heavy snow pack, and 36°F (2.22°C) temperature at midday. A previous visit offered sunnier conditions but a cold, biting wind. 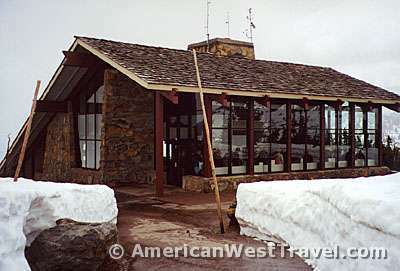 The chalet-style visitor center (right) offered welcome warmth and excellent views from the picture windows. 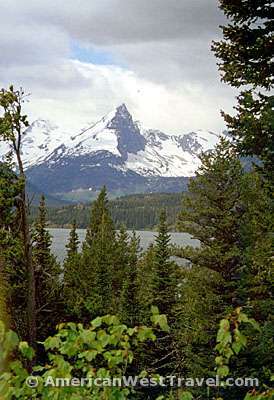 At left, a view of the divide from St. Mary Lake on the park’s east side.